Disclaimer: I do not read Persian, so I can only comment on the English translations and versions of this poetry. I hope to find some friends who can point me toward good videos and audio recordings of these poems in their original language. Photo credits: The image above is the inside of Rumi’s shrine, in Koyna Turkey. The image further down is the outside. By some accounts, Mawlana Jalaluddin Rumi, a great poet who lived in the 13th century, is currently the most popular poet in the United States. (BBC (2104). An Amazon search, admittedly not the most scientific approach, turned up – in descending order – Maya Angelou, Dr. Seuss, Mary Oliver, Edgar Allen Poe, Walt Whitman, Allen Ginsberg, Claudia Rankine, Rumi, Kahil Gibran, and Homer. While I find this a fascinating subject, it’s not the purpose of this post, so I must move on. If you really want the scoop on America’s relationship to poetry, you will enjoy Kate Angus’ post “Americans Love Poetry, But Not Poetry Books” at this link. Heaven help us. My intention here is to point you toward different translations of Rumi’s poetry. The following is a goodly sample. I also include translations of Hafez, whom we will also read at our Persian New Year event, if we have the time and/or if he is requested. Recommended translation by Franklin D. Lewis. Rumi: Swallowing the Sun (poems). At Amazon. Rumi – Past and Present, East and West: The Life, Teachings, and Poetry of Jalâl al-Din Rumi (2007) — biography. At Amazon, on GoodReads. Reviewed on JSTOR. Mystical Poems of Rumi (new edition with forward by Franklin D. Lewis, 2008. At Amazon. More about A. J. Arberry at Wikipedia, including a link to his translation of the Quran. Robert Bly interviewed by Bill Moyers about Hafez and Rumi, reading his translations of their poems. The Angels Knocking on the Tavern Door. Thirty Poems of Hafez. (2004) Amazon. Poems of Rumi (Translated and Spoken By Robert Bly and Coleman Barks) – audio recording. On iTunes and at Amazon (1989). Davis reading his translations of three poems by Jahan Malek Khatun, an Inju Princess, on the News Hour on YouTube. If you want analysis on the different translations and versions, an excellent on-line source is the Dar-al-Masnavi, curated by the international Dar-al-Masnavi group. 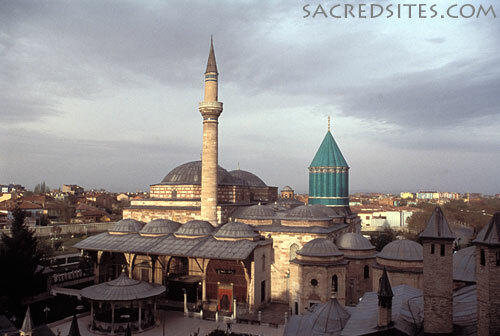 The site discuss the problems of translating Rumi. After more than 700 years, Jalaluddin Rumi might be the most popular poet in the United States. Largely due to US authors, such as the poet Coleman Barks, who has rendered literal translations of Rumi into free verse “American spiritual poetry” in a manner which has reached so many different sectors of American society. Unfortunately, this popularization has a real price: the frequent distortion of Rumi’s words and teachings which permeate these well-selling books. The English “creative versions” rarely sound like Rumi to someone who can read the poems in the original Persian, and they are often “shockingly altered.” Few American’s realize this however, believing instead that versions are faithful renderings into English of Rumi’s thoughts and teachings (when they are very often not). 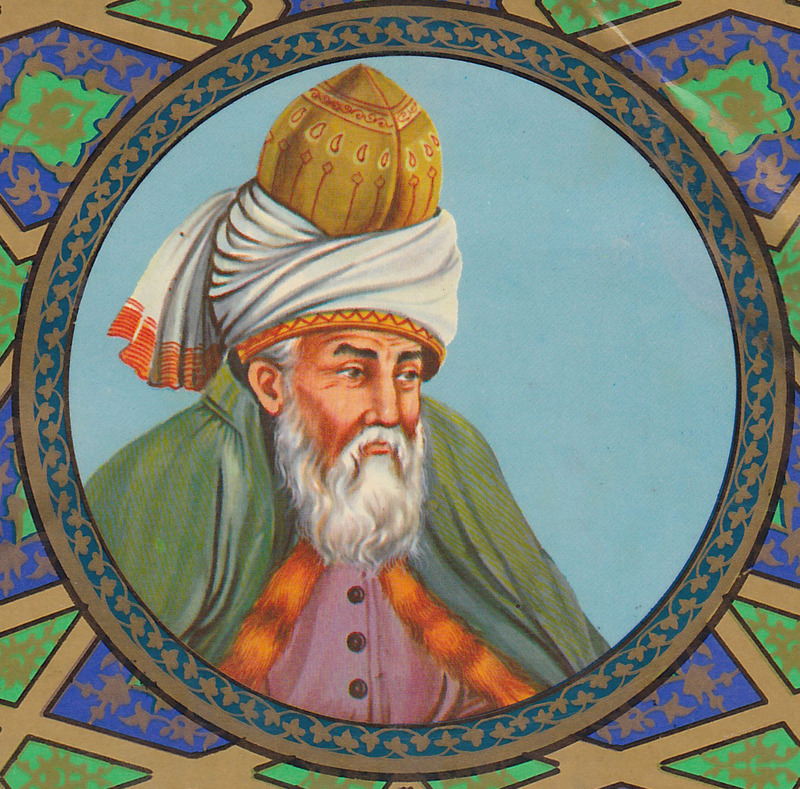 For the original essay on this subject (which I have drastically summarized above) visit the site to read about the popularization in the United States of Rumi’s poetry, and more about the difference between versions and translations. Of special note to anyone interested in the idea of translating poetry (in any language) consider the author’s comments on Ezra Pound’s scholarly translations of Li Po’s Chinese poems and Japanese Noh plays. As part of my International Poetry Cantos project in 2015, Canto Number 2 is Persian New Year Poetry. Persian New Year is celebrated on March 20, 2015 — the date of the Vernal Equinox. 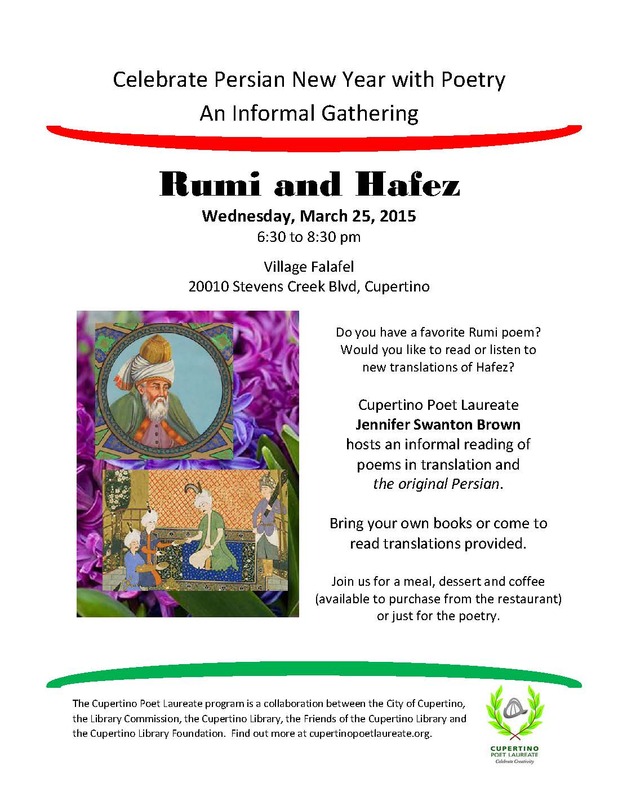 On Wednesday, March 25, please join me in reading poems by Persian poets, in Farsi and in English. We’ll be meeting at Village Falafel, on Stevens Creek Blvd in Cupertino, at 6:30 pm to read poems together and to eat. To prepare for this event, I want to introduce you to Persian poets of repute, but first a little background. 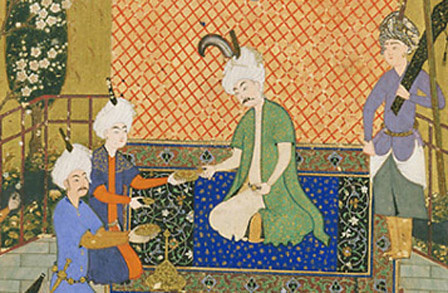 Persian literature is one of the world’s most ancient literatures. You can read about it on Wikipedia for a fast overview, or at the Iran Chamber Society, or Encyclopedia Britannica. Obviously a few websites can’t do justice to this rich tradition, but if you have no familiarity, I suggest spending a few moments to orient yourself. When we speak of Persian poetry, we mean in general, poetry written in Farsi, also known as Parsi or Persian, or poetry written by people who live in the land currently known as Iran. An interesting source is Classical Persian Poetry: A Thousand Years of the Persian Book, a fascinating look at a Library of Congress exhibit. The most famous (to Americans) Persian art form is the ghazal, described here by the Academy of American Poets. This link takes you to a lovely example of the form, in English, by poet Agha Shahid Ali on the Poetry Foundation website. Though a Kashmiri Muslim, Ali is well known for writing in this form for American audiences. While I am not an expert, I found this website, with literal and poetic translations of some of Rumi’s famous ghazals to be very enlightening and inspiring. The most well know Persian poets in the U.S. are Rumi and Hafez. Here are some resources. Poetry Foundation video, in collaboration with The News Hour, “Bringing Persian Poetry to Western Readers” about Hafez. There are many books, translations, essays, fantasies about these legendary and vital poets. I’ll be pulling together a bibliography in the next week, getting us ready to read on March 25. There’s a group on Facebook doing this, and since I’m not clever enough to share that Facebook Group Event, I’m putting the information here. Poets who wish to participate have until Friday, September 19th, 2014 to email their address to the website. On that weekend, they will receive two randomly-picked mailing addresses; they could be from the other side of the world, or just down the street. Poets will buy (or make) two postcards, write a short poem on the back of each (preferably about the pictures on the front of each postcard), and send them to their mailing addresses before the end of September. Easy, right? Come October or November, you will hopefully receive two poems in your mailbox from two complete strangers… poems written just for you! You will receive a reply email with all the details and an FAQ section. In the meantime, help make this project grander by passing this event on to any poets you know! Spread the word, and help spread good words in the mailboxes of the world! In this New York Times article, read about a request (internationally!) for youth to write and share poetry in response to what happened in Ferguson, when unarmed black teenager Michael Brown was shot and killed by police, and the protests and violence that followed. This project is produced by the Off/Page Project, which combines the analytical lens of The Center for Investigative Reporting with the groundbreaking storytelling of the literary nonprofit Youth Speaks. Living at the intersection of youth voice and civic engagement, the Off/Page Project provides a multimedia platform for young people to investigate the issues and stories that would otherwise be silenced. Here is a great story about her fight for women’s rights (from the Washington Post). 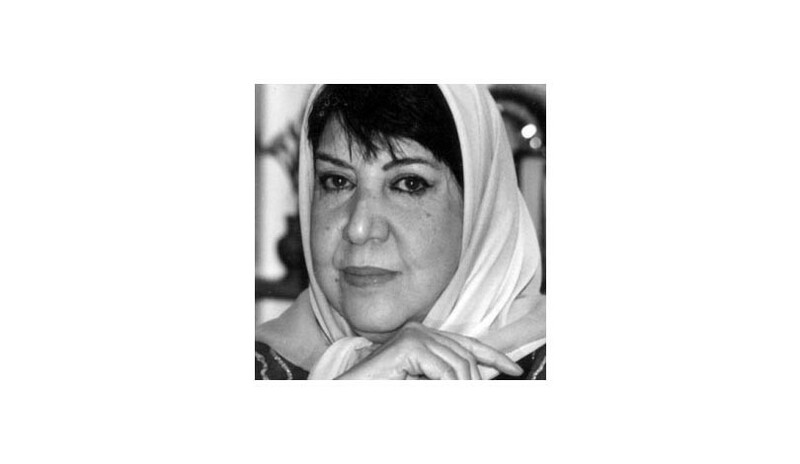 At this great website, you can read in English or Iranian, poetry and commentary. You can also see the video of President Obama reading her poetry. This photo is from that site. I love the look in her eyes — far away gazing with full knowledge and ferocity. I look forward to learning more about this woman’s poetry. Share a comment here if you already are a fan. It’s been a busy day. I don’t have much energy for (even) poetry, Luckily, the 2014 Pulitzer Prize in Poetry was awarded today to Vijay Seshadri. As this NPR Book News article says, this winner was unexpected. I know nothing about Mr. Seshadri, other than he was born in Bangalore India, in 1954, and he must be a great poet. This should make him of particular interest to our Cupertino community. Here’s a biography of Mr. Seshadri from Poets.org and here is a poem of his, that speaks directly to our guilt and privilege, and the mysterious nature of our survival. I look forward to learning more about his poetry. or stepped off the ledge in despair. the defeated and the drowned. and all your good luck.